Prime Minister Narendra Modi on Friday inaugurated the Dhola-Sadiya Bridge in Assam, which is India's longest river bridge. 1. Spanning 9.15 km, the bridge is built across the Lohit river, which is a tributary of the Brahmaputra. It will connect Assam and eastern Arunachal Pradesh. The total length of the project, including the approach roads on each side, is 28.50 km. 2. The bridge is located 540 km from Assam’s capital Dispur and 300 km from Arunachal Pradesh capital Itanagar. It connects Sadia town in Assam’s Tinsukia district with Dhola village in Arunachal Pradesh. 3. The bridge will reduce the travel time between Assam and Arunachal Pradesh from six hours to just one hour as the distance will shrink by 165 km. 4. It is 3.55 km longer than the Bandra-Worli sea link in Mumbai. The sea link has now become the second longest river bridge in the country. 6. A sum of ₹ Rs 2,056 crore has been spent on the bridge that can withstand 60 tonnes of weight, including battle tanks. 7. The bridge, which has a three-lane carriage way, will also cater to the strategic requirements of the country in the border areas of Arunachal Pradesh, besides facilitating numerous hydro power projects coming up in the State, as it is the most sought after route for various power project developers. 8. 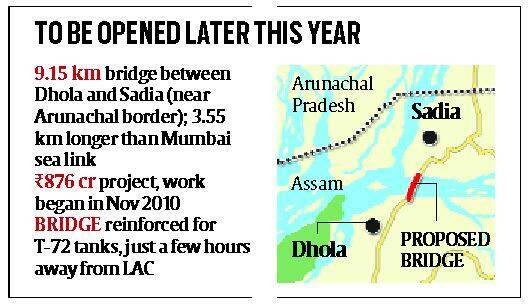 The bridge will make it much easier for Army convoys to reach outposts near the China border. It is also expected to boost tourism as there is no civilian airport in Arunachal Pradesh and this will make the road transport smoother. 9. The bridge will increase industrial investments with better border trade between the Northeast and South Asian countries. 10. State-run SAIL is the largest supplier of steel for the bridge. The PSU has supplied around 90% or around 30,000 tonnes of steel, including TMT, structurals and plates, for the bridge.